Available from Tate Galleries, Tate Publishing, and good bookshops worldwide. 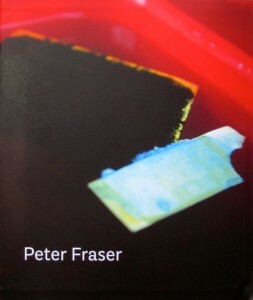 ‘Peter Fraser is a British artist who has been at the forefront of contemporary photography since the early 80′s. After a landmark exhibition with William Eggleston in 1984, he became one of the first British photographers to work exclusively in colour and over the last 30 years he has built up an influential and important body of work. All of Fraser’s photographs are ‘found’ still lives. he does not construct his pictures but rather focuses on the objects and images he finds around him. Bringing together an interest in journeys – at once literal, literary and psychological – alongside a sustained and almost obsessive enquiry into the the matter and materials of the everyday, he creates highly charged images of enormous intensity and resonance. Through his lens often humble subjects reveal something more enigmatic and profound, opening our eyes to the strangeness and incidental beauty of the visible world. Produced on the occasion of his exhibition at tate St Ives, this fully illustrated monograph is the first publication to bring together photographs from all of Fraser’s major series to date, including 12 day Journey (1984), Ice and Water (1993), Deep Blue (1997), Lost for Words (2010) and A City in the Mind (2012). Featuring a new extended essay by David Chandler, Professor of Photography at the University of Plymouth, it explores Fraser’s life and work in depth, tracing his development in relation to British and international photographic practise, and placing his practice within the broader context of postwar British art. The monograph also includes an illuminating new interview with Fraser by fellow photographer Jem Southam and an illustrated biography. Fraser (b.1953) graduated in photography from Manchester Polytechnic (now Manchester Metropolitan University) in1976. In 2002 the Photographer’s Gallery, London, staged a twenty year survey of Fraser’s work, and in 2004 he was shortlisted for the Citibank Photography Prize.